These red bikes are everywhere right now. “Jump” Bikes they are called. I don’t know much about them except they are apparently rentable and work with some sort of app. Oh and you don’t have to bother parking them in proper bike racks, you can just leave them wherever you want, like on the sidewalk or by the doors of any building, like you’ve not noticed the bike racks that are like right there. Certainly seems that way. Do they go faster than a normal bike? Seems like it. I wouldn’t know, I’ve never ridden a Jump bike, for all I know they are smooth as martinis (I wouldn’t know that either, I’ve never drunk a Martini, for all I know they are smooth as Dr. Pepper) (I’ve never drunk Dr Pepper either, I could go on all day with other things I’ve never done, it’s a long list). I don’t think these Jump bikes actually jump either, I would have assumed they bounce down the street like Tigger, but they don’t. They aren’t particularly pretty, being bright red with those rigid shapes and fixed on basket (why can’t it bounce around uncontrollably like my wire frame one, coming off its hinges every time I go over a bump?). 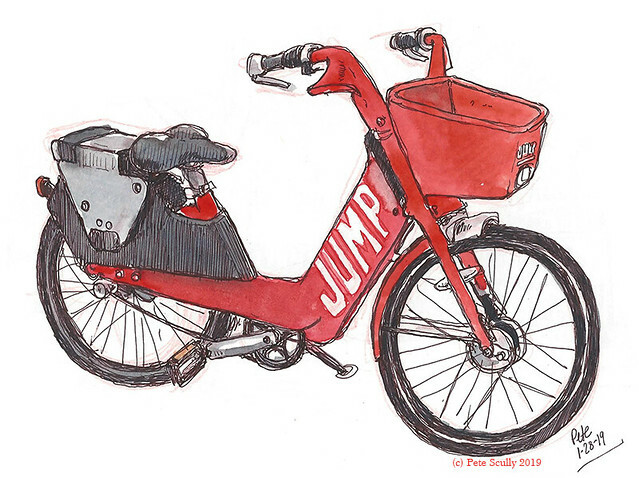 Haha, here’s me talking about these Jump bikes, I’ve never ridden them, I can’t even really draw them (seriously why do I even bother drawing wheels, I can’t draw circles while standing holding a sketchbook) and I know nothing at all about how they work. This is how people do it now though isn’t it, just say ill-informed stuff online when it would take 10 seconds to find that information out, if only we had instant access to like the entire world’s information in our pockets on little electronic devices or something, that would be a great idea. (Like British Tory MPs who tweet incorrect information about the Marshall Plan which is so easy to call out, almost like he knew that already and was trying to get attention for himself) (errrr…no, I’m not doing that. /Shudder!/) Alright fine, let’s look up these Jump bikes. /Googles Jump Bikes/ Ok, so they are, wait let me get this right, ride-shares? Owned by Uber apparently. They were introduced to Davis and UC Davis in May 2018. Here’s an article about them which explains them more. Unlike those bikes they have in London they are dockless which means you just leave them anywhere (apparently you get fined $25 for not locking them up in a proper rack). They do have an electric assist which is probably what the ‘Jump’ means. I don’t fully understand the fee structure but $1 for the first 15 minutes then 7c a minute after that seems to be the thing. So, you leave the bike. Ok, does that mean if someone else wants it they just take it? Do you have to look for another one? That’s great, when you wanted to ride home and oh man, they are all gone – better call an Uber…oh I understand now, they’re owned by Uber. Now you are probably reading this thinking, you dinosaur, I love these, my life is so much easier thanks to Jump bikes, get back to 1985 Marty McFly. To which I say, these don’t hover, they don’t even jump. I’m sure these work for a lot of people but I think I prefer just having my bike, I think I’d feel a bit stressed out by these modern contraptions with their fee structures. Of course when I get a flat tyre and these Jump bikes go whizzing by me, I’ll be like, noooo!!!!! Curse you Jump bikers!! Now I’ll have to walk!! 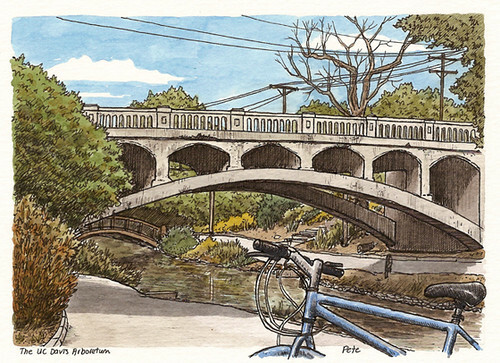 Last Sunday we held the latest “Let’s Draw Davis!” sketchcrawl in downtown Davis, starting at the Amtrak Station and finishing up at Mansion Square. This one was, unlike the other ones I’ve organized in Davis, a “scavenger sketch-hunt”. I provided everyone with a list of things at the start, things which could be found in that section of downtown Davis, and they had to draw between 8-12 of them to win a sticker at the end. In truth, just getting to the end meant you got a sticker, but it’s a good fun way to explore and have ideas of things to draw. I think everyone really enjoyed it! I was told it helps some people get over the “what should I draw” conundrum, like Inktober or Every Day Matters – little prompts, totally optional. I’ll do that again. As you can see, splotches of rain started slowly splashing onto the page as I sketched Omar and Jesse; I had to duck under cover when adding colour to Emily’s sketch. Here is my sketch of the Amtrak Station, sketched in a dry spot next to the building opposite. Most sketchers had ducked for cover, but there is one with a brolly (a few others held umbrellas and sketched too but didn’t last as long as that sketcher!). Yeah it was raining hard when I sketched this bike. I was stood beneath a shopfront awning and the rain was still getting to me, so I just painted it quickly. I had wanted to sketch either the large giraffe statue or the giraffe bench opposite this on F Street, but the rain was too heavy to get a decent vantage-point. I did have a nice dry spot to sketch the Davis Barber Shop though. I have never sketched this place before, and should really sketch inside some day. I was glad they were open on Sundays. The barber was kind enough to let other sketchers in to sketch, and I think he liked my rendition of the outside. I kept it simple and didn’t add paint, as I wanted to move on. I have sketched the Varsity a million times before and this day was so rainy and grey that I didn’t need to worry about that blue sky bringing out the white building or the shadows cast beneath it, however the pink and blue of the neon sign was too cool to pass up. I added a blueish grey marker to the foreground tree. Right, a few items to check off the scavenger hunt list. The street sign, obvious. The bottle, that was at De Vere’s though I had included a bottle on the list just to advertise my show at Putah creek Winery, basically, in case people went by there. And the trumpet, fulfilling the ‘musical instrument’ sketch. Actually it is a coronet, and I sketched it at Watermelon Music on E St, which will be vacating its downtown spot at the end of the year and relocating to West Davis, due to the new landlords downtown forcing all these local businesses to close. Yes, some tough times ahead for downtown. Well, I like Watermelon, and bought some guitar strings as I am inspired now (after seeing Paul McCartney live in Sacramento recently – wow that was awesome! My 12 year old Macca-obsessed past self was smiling down on me that night). Several other sketchers had been in drawing stuff, they didn’t seem to mind too much, and I asked if it was ok if I drew too. I’ll miss them; I probably won’t cycle out to West Davis, see, kinda far for me. Yeah, the rain was getting a bit much so time for an interior, and where else but De Vere’s. This time I drew the familiar bar but played a bit with the colours and I LOVE it, that blue and yellow. I’ll do more of that. I had a nice stout, good choice on a drizzly day. And then we all met up at the end, well about a quarter of those who had started, and I gave out more stickers such as those ones below. I hope everyone had fun! 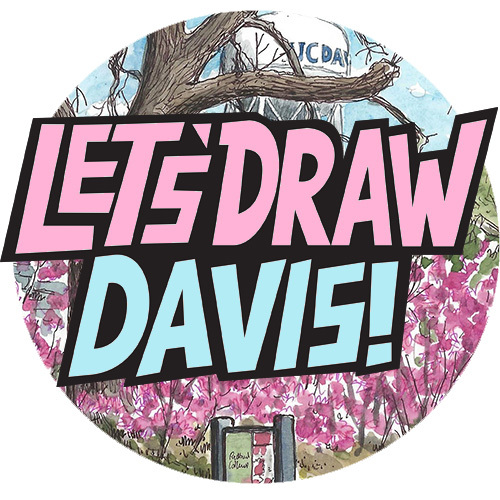 The next Let’s Draw Davis sketchcrawl will be on Saturday November 12, at Vanderhoef Quad on the UC Davis campus, starting at 10:30am. I’ll post a poster soon! I’ve not been feeling well the past few days (I’m home doing nothing but watching telly, drinking tea and listening to the dishwasher right now), but yesterday I managed to get out for some fresh air on my bike, and cycled around Davis in that laborious way you do when your legs are saying, you should be at home on the sofa. The sunshine was good for me though. 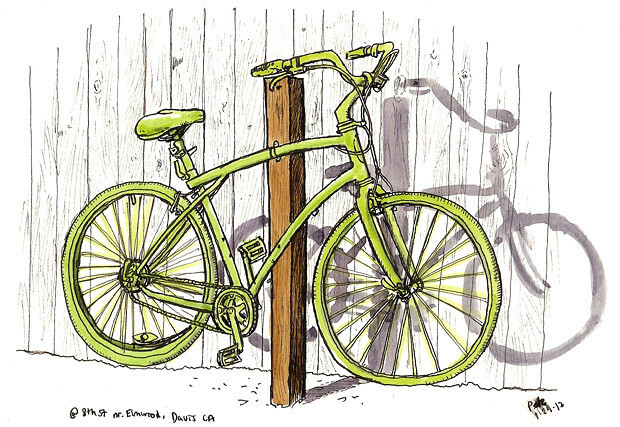 I stopped on 8th street to do some sketching, after I saw a row of bicycles, each painted tip to toe in a different bright colour, nailed to stakes alongside someone’s garden fence. That’s peculiar, I thought, so I drew the lime green one. It’s so green it reminded me of Fungus the Bogeyman. Interesting public art in a bike-mad town. 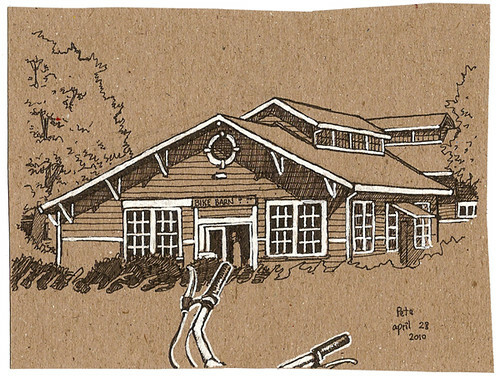 Drew the UC Davis Bike Barn building…again. Well it has one of those looks, cant help but be turned into a drawing. The way one side of the roof is longer than the other, the shadow beneath the eaves, the unsketchable army of bikes in the foreground. I still have that brown paper cut up from envelopes. I forgot to mention: Davis is now home to the newly opened (last weekend in fact) U.S. Bicycling Hall of Fame. That’s right, the actual hall of fame for bike-riders. I wonder if they have a special section for those ones who cycle up on the inside of buses as people are trying to get off, those cyclists deserve a medal, yeah. And the ones who go around texting or yapping into their cellphone with their ipod in their other ear. Hang on, I’m starting to sound like a certain Tory politician on the eve of the election. “Last week I met a 70-year old nurse who told me he couldn’t get on the bus because all the unemployed eastern european immigrant asylum seekers were cycling around with their ipods and their mobile phones taking our jobs and claiming our benefits…” Oh, the UK General Election is only a week away now, and with ‘bigot-gate’ or whatever it’s being called, we’re already having our Joe the Plumber moment, or will if the Murdoch press has its way. I really hope the media leaves that poor pensioner alone, but have a feeling she’ll be used to the fullest extent by The Scum newspaper over the next week. Putah Creek, running through the long UC Davis Arboretum, has a lot of bridges. Well, it has to, otherwise getting to the other side would be a very long walk. Some bridges ar wooden, like the one in the background, and even covered in foliage like some Monet painting, while others a big and concrete, which might not sound too picturesque but in this case I quite like it. I’ve drawn this bridge before. It’s April in Davis, California. Tomorrow, the annual Picnic Day takes place, the largest university open house event in the country. It’s Davis’s day to show off. There will be thousands of people there. This year I might even do some drawing. If you didn’t know, Davis is a cycling capital. 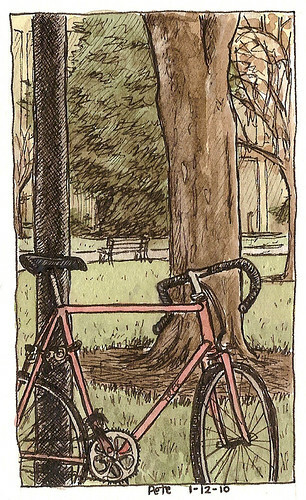 There are bikes everywhere, and I mean everywhere – especially just before and after classes on the UC Davis campus. they come from left and right and behind and probably from above and below too. They’ll cut you up, whizz through stop lights, pay no attention to other cyclists turning, and occasionally mash each other up around the roundabouts (which can be entertaining). Just this morning a guy cycling behind me flew off his bike at speed while turning a puddle-riddled corner. I noticed he had headphones in both ears (oooh, that’s against the law). You see a lot of people texting while cycling too. WTF? There is a bike cop on campus who gives cyclists the odd telling-off for riding in no-cycling zones, and occasionally cops will stop cyclists who actually do follow the rules of the road, and give them a reward for their good behaviour. It’s true, I read it in the paper. Sometimes, with all these bikes, there is just nowhere to park. The owner of this red bike just chained their road-bike to a lamp-post. That was nice of them. It gave me something to draw at lunchtime. After six days of 100-plus weather, it finally felt a bit cooler tonight (though it was mid-90s today). 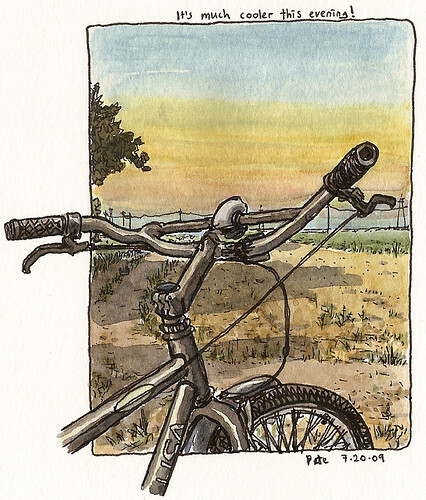 I cycled down to the edge of Davis, to that spot by the levee I sketched a couple of Mondays back (it’s always when the Bachelorette is on TV that I head down here). That sketch is here. The sunset, if you’re wondering, is in the other direction, this mass of colour in the sky is likely from the terrible hazy air we have here in the Valley, it just hangs there above Sacramento, especially in heatwaves. The Delta Breeze is in tonight though, cooling everything down. There’s my bike again. It’s standing up now, because I had a kickstand added to it. In the distance, West Sacramento. I heard on the news yesterday that a mountain lion had been spotted in West Sac. The mountains are behind that haze in the distance; perhaps it is just lost. I kept my eyes open.